Skin cells are living breathing organisms that need to be cared for and nourished to keep them healthy therefore if the cells are abused and neglected then the aging process is accelerated thus causing the skin to wrinkle and sag. 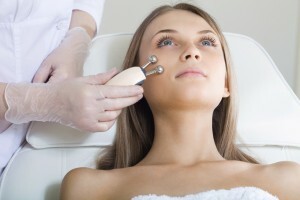 It was discovered that galvanic current skin care technology can reverse this process and make a dramatic difference in the appearance and health of skin even after a single treatment, as the galvanic facial allows a much deeper penetration of active ingredients of skin products than manual applications due to the process of ‘Ionization’. This ‘Ionization’ or ‘Galvanic Iontophoresis’ reduces the applied products (anti-wrinkle serums, Collagen, ATP etc.) to very small ions, facilitating more product penetration into the skin for more effective utilization. It also reduces the oiliness of the skin for those prone to acne while helping to clean the congestion. This type of facial helps improve the normal functions of the skin by helping to improve the skin’s blood circulation. As products are absorbed directly through the skin regular galvanic treatments can dramatically take years off of the appearance and will help the skin tighten naturally giving it a youthful, healthy, and vibrant glow.Galvanic Iontophoresis gives the skin a radiant, healthy-looking glow with a combination of safe, gentle, low-level galvanic currents and specially formulated products. Galvanic Iontophoresis is essentials for mature skin care! Galvanic facials are suitable for all skin types. It is a non-intrusive method of skin rejuvenation with no side effects.